In an effort to add healthier food into my diet, I purchased natto. For those of you who don’t know, natto is a nutritious source of protein made of soybeans and will make you stronger if you eat it. 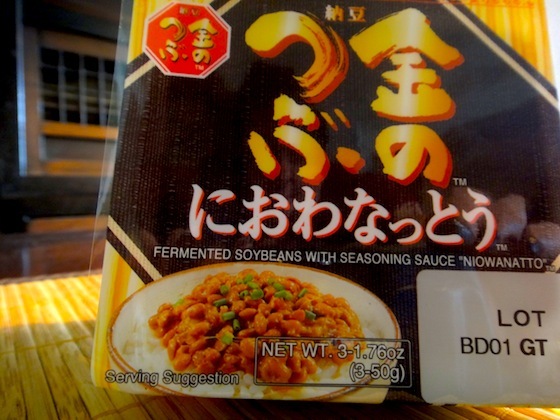 Because the soybeans are fermented, natto is also sticky, smelly, and – in my opinion – gross. But I want to eat it. I just don’t know how. Natto is typically served over rice, but I find the taste intolerable, and the stickiness makes it hard for me to maneuver my chopsticks. I’ve tried them in an omelet once, which was somewhat better, but still not great. A friend suggested I try it in tacos with Mexican spices. I haven’t done that yet, but I’m intrigued. I’m looking for more suggestions. What’s your favorite way to eat natto? How did you acquire the taste? Leave comments here below or on JapanCulture•NYC’s Facebook page. Coated the natto nut with flour and toast / dip fry it. I think this is the better way instate of eating the stickiness and smelly nuts. Ling, I like your idea! Thanks for the suggestion; I’ll try it!